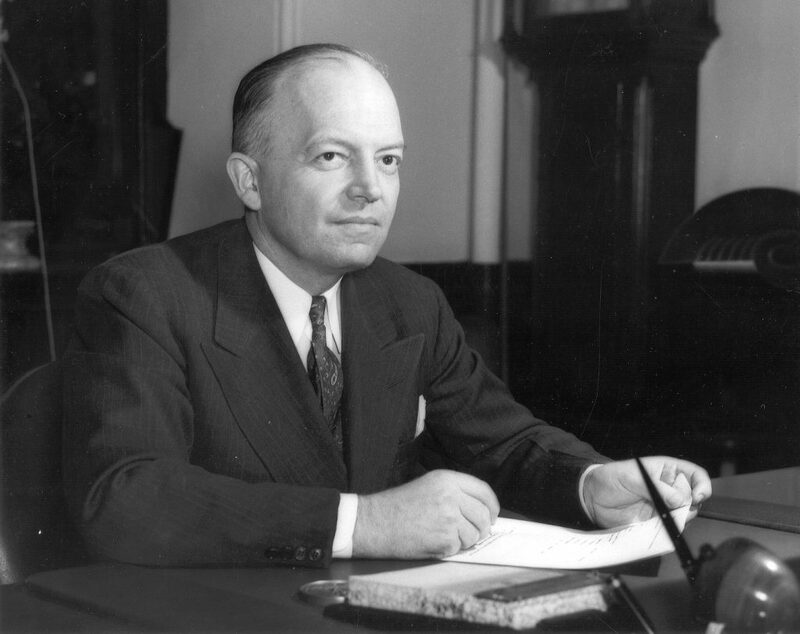 When the Trustees met on 17 September 1948 to elect a new president, they did not choose another Pennsylvanian to follow in the footsteps of George McClelland; instead they chose Harold E. Stassen, former Governor of the state of Minnesota. Stassen came to the office after making an unsuccessful bid for the Republican nomination for President of the United States during the 1948 campaign. Although Stassen hadn’t spent years in a university setting, he brought a great deal of administrative and political experience to the presidency, which enabled him to advance the University in directions that the previous presidents had not. 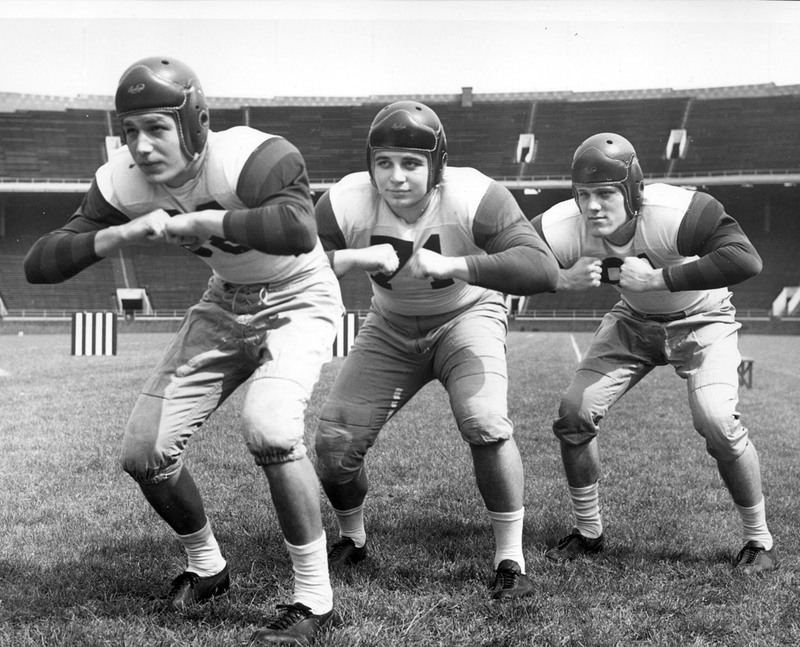 While Provost Penniman and Presidents Gates and McClelland focused on refining educational programs at Penn, Stassen focused on fulfilling McClelland’s campus expansion plan, as well as reforming intercollegiate athletics in order to conform to the requirements of the new Ivy League. 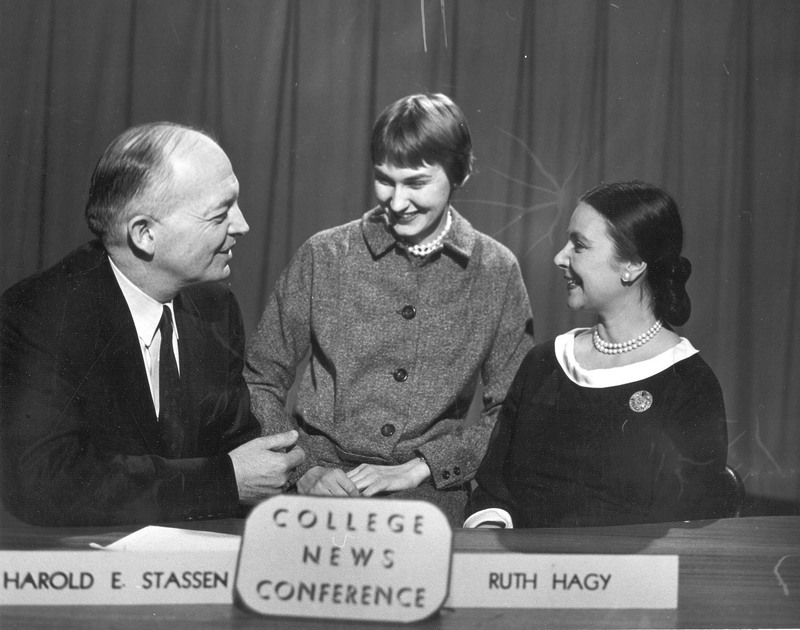 Unfortunately, Stassen was also noted for his frequent absences from campus, particularly during the 1952 spring semester when he made another bid for the Republican Presidential nomination. Nevertheless, Stassen managed to make significant improvements to education at Penn, even if he did so from a distance. First and foremost, Stassen announced and carried out McClelland’s plan for expanding the campus. At their 25 October 1948 meeting the Trustees formally adopted the “Report of the Trustee’s Committee on Physical Development of the University” as the future plan of the University. This Committee, chaired by architect Trustee Sydney E. Martin, finalized the expansion plans developed under former president McClelland and the General Committee of the new University of Pennsylvania Fund (see McClelland). The report also finalized site locations for the new Physics Building, the new Wharton School, the new Library, the Chemistry Building, the Women’s College, and new Hospital Buildings, among others. Stassen appointed Trustee Thomas S. Gates Jr. as Chairman for the Development Fund, which replaced McClelland’s University of Pennsylvania Fund, but retained the same $32 million goal. 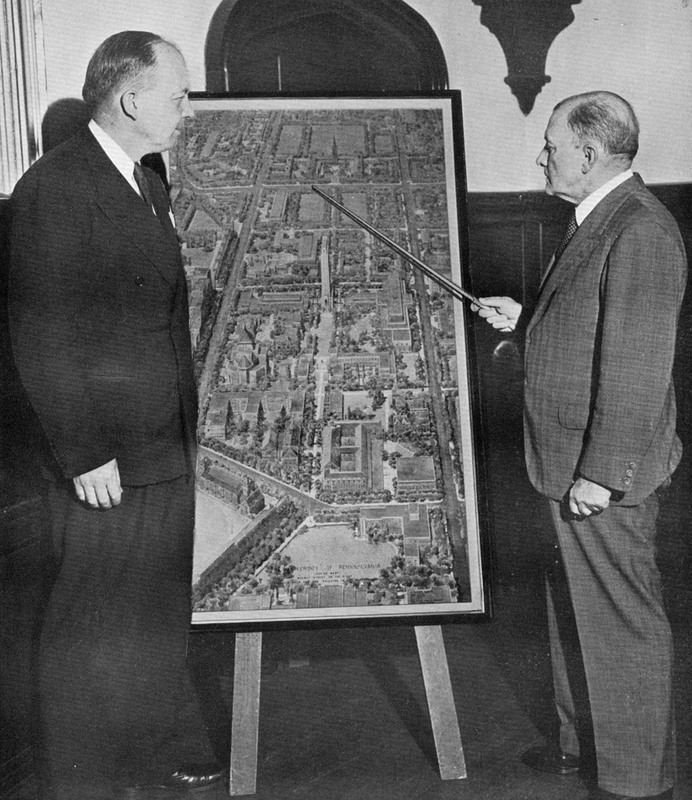 The University announced the plan in December 1948, as reported by the Pennsylvania Gazette in “Expansion Plans Revealed.” The article detailed Stassen’s strategy to give priority to four of the building projects included in the Committee’s plan: the Wharton building, the physics building, the new library, and two new additions to the hospital. One of the new hospital buildings would house an outpatient department dedicated to the memory of former president Thomas Sovereign Gates. The article also revealed that, “Locust Street would be developed through the campus as a wooded mall, closed to vehicular traffic from 36th Street to 40th.” Locust Street thereby became Locust Walk, which became the backbone of an expanding campus. The Stassen administration further promised to construct all the new buildings in a traditional style by refusing to build skyscrapers and by utilizing brick and limestone. By the end of Stassen’s tenure in January 1953, Dietrich Hall of the Wharton School had been completed and opened, while the Thomas Sovereign Gates Memorial Pavilion of the University Hospital stood near completion. The construction of a new physics building was delayed due to the availability of the site; however by January 1953 the University had secured both the site at 33rd and Walnut and a low bid from the Baton Construction Company. By 1 January 1953 the Development Fund’s total was in excess of $9,414,000. On resigning the Presidency may I, with all the emphasis I can command, state that my keen interest in the future success of the University and in its service to America and the world will be lifelong and that my deep affection for Pennsylvania will be enduring. While the Stassen administration made important strides in all of these areas, the most significant advances pertained to the student body, scholarships, athletics, the faculty, and of course, physical facilities. The “current direction” also revealed important plans for the future of the University. When Stassen reflected on the evolution of the student body in “Four Years at Pennsylvania,” he described his efforts to revise the admissions process and to improve student relations. At the 10 December 1948 meeting of the Trustees Stassen announced that former president Dr. McClelland would conduct a special study on issues related to admissions and would recommend new policies for the following year. McClelland informed the Trustees of the completion of his survey on 8 April 1949. As a result of the survey the administration instituted limits on the enrollment of new students for all the schools. In “Four Years,” Stassen further explained that the University’s new admissions policy brought students from all types of economic, racial, religious, geographical and national backgrounds, that all students were required to take the College Entrance Board Examinations, and that alumni actively recruited promising students for the University. Stassen successfully reorganized admissions in order to make the University more competitive and more diverse. Stassen also concerned himself with student relations insofar as he worked to give them a stronger voice. In order to make student voices heard he established a new All-University Student Council in April 1949. At the 8 April 1949 meeting of the Trustees, at which he introduced the Council, he articulated his intentions to meet with a student group once every three weeks. In “Four Years” he reiterated his earnest efforts to get input from the students by describing the annual dinners he held for all of the prominent student government organizations around campus each May. Stassen’s commitment to the students also extended to financial aid. In addition to increasing funding for both senatorial and graduate scholarships Stassen created a whole new scholarship program in June 1950 that remains one of the staples of the University to this day: the Benjamin Franklin Memorial Scholarship. In “Program for the Establishment of the Benjamin Franklin Memorial Scholarships: University of Pennsylvania” the administration outlined a program that provided full tuition plus a $250 annual stipend to exceptional incoming students, beginning with the 1951 admissions year. The number of students awarded the scholarship would vary from year to year. Those awarded also had a moral obligation to repay the University after graduating so that future students could continue to benefit from the program. No student entering after 1 September 1953 shall be eligible for whose secondary school education was subsidized or whose post-college education is promised by an institution, by an individual or group of individuals not closely related to the family as a consideration for his attending the particular institution. By committing to the Ivy Group Stassen made academics the most important aspect of the Penn student’s experience. With understanding leadership and a wise use, a University Senate can become, in these times of rapid and great change, an instrument for developing understanding, stability, and cohesion among the Faculty, the Administration, and the Trustees, and, therefore and instrument for achieving greater University progress. The University Senate enabled the faculty to contribute to the policy development of the University. While all of Stassen’s points didn’t relate to the harm the Loyalty Oath Bill would inflict upon the faculty, his position certainly reflected his support for freedom of academic expression. He felt that the University could not fulfill its functions and duties without it. The Bill was ultimately defeated, surely in part due to President Stassen’s efforts. Stassen’s contributions to the development of Penn’s physical plant were also significant. In addition to the Sydney Martin campus expansion plan discussed earlier, a War Memorial Flagpole was erected during his administration. He made the completion of the new library the main priority for the years ahead. These nine goals reflected Stassen’s continuing devotion to Penn. Harold Edward Stassen made his presidential mark by designing and implementing an ample number of administrative reforms and by significantly contributing to the physical development of the campus. While his time in office was relatively brief, he made the most of his four and a half years by utilizing the talents he gained from his career in politics and civil service. He successfully improved the university in the best way he knew how.